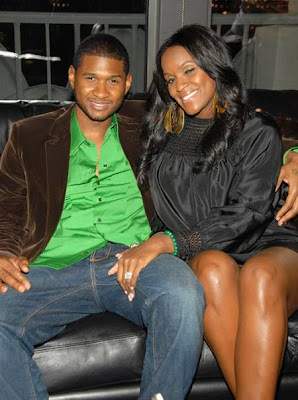 Usher fights a daily battle to stay faithful and true to his resident beard Tameka, because he's "not good" at being in love. And while Usher insists marriage and commitment have changed his life for the better, he admits monogamy doesn't come naturally to him - and he has to fight his wandering eye. The star tells Cosmopolitan magazine, "I'm good at making love, but I'm not good at being in love. It's a conscious decision every day to love the person you're with." --Call me a conspiracy theorist, but until I see concrete evidence, I will forever believe that Tameka's a man and they mailed ordered that baby from Namibia! [I kid, I kid] You know Ursh likes to shut peoples site down! LOL.